May 7 is the 127th day of the year(128th in leap years) in the Gregorian calendar.There are 238 days remaining until the end of the year. 1846 – The Cambridge Chronicle , America's oldest surviving weekly newspaper, is published for the first time in Cambridge, Massachusetts. Year 351 (CCCLI) was a common year starting on Tuesday of the Julian calendar. At the time, it was known as the Year of the Consulship of Magnentius and Gaiso. The denomination 351 for this year has been used since the early medieval period, when the Anno Domini calendar era became the prevalent method in Europe for naming years. Year 165 (CLXV) was a common year starting on Monday of the Julian calendar. At the time, it was known as the Year of the Consulship of Orfitus and Pudens. The denomination 165 for this year has been used since the early medieval period, when the Anno Domini calendar era became the prevalent method in Europe for naming years. Year 721 (DCCXXI) was a common year starting on Wednesday of the Julian calendar. The denomination 721 for this year has been used since the early medieval period, when the Anno Domini calendar era became the prevalent method in Europe for naming years. John of Beverley was an English bishop active in the kingdom of Northumbria. He was the bishop of Hexham and then the bishop of York which was the most important religious designation in the area. He went on to found the town of Beverley by building the first structure there, a monastery. John was associated with miracles during and after his lifetime, and was canonised a saint by the Catholic Church in 1037. 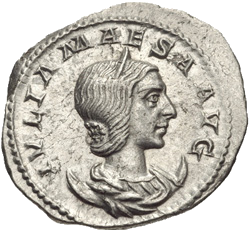 Flavia Domitilla, daughter of Domitilla the Younger by an unknown father, perhaps Quintus Petillius Cerialis, had the same name as her mother and her grandmother Domitilla the Elder. She was thus a granddaughter of Emperor Vespasian and a niece of Emperors Titus and Domitian. She married her cousin, the consul Titus Flavius Clemens, a grand-nephew of Vespasian through his father Titus Flavius Sabinus. Blessed Gisela of Hungary was the first queen consort of Hungary by marriage to Saint Stephen of Hungary, and the sister of Henry II, Holy Roman Emperor. She has been beatified by the Roman Catholic church. Harriet Starr Cannon founded the Sisterhood of St. Mary, one of the first orders of Augustinian nuns in the Anglican Communion and which remains dedicated to social service. Saint Agathius, also known as Achatius or Agathonas or Acacius of Byzantium, according to Christian tradition, was a Cappadocian Greek centurion of the imperial army, martyred around 304. Agostino Roscelli, also known as Augustine Roscelli, and Augustin Roscelli, was an Italian priest who inspired social change in Genoa, Italy for children and disadvantaged women. He was canonized a saint in the Roman Catholic Church in 2001 by Pope John Paul II. Pope Benedict II was Pope from 26 June 684 to his death in 685. Pope Saint Benedict II's feast day is May 7. ↑ Night Owl, Gary, ed. (August 13, 2005). "Dorothy Sunrise Lorentino". Wotanging Ikche. Marietta, Georgia: Native American News. 13 (33). Retrieved 28 July 2017. Wikimedia Commons has media related to May 7 .